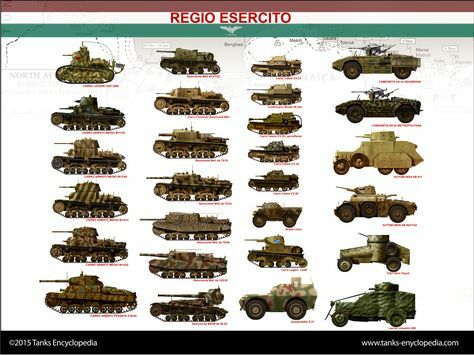 By the time the Regio Esercito entered the war, in May 1940, the armored branch of the army was far from being ready. Most numerically important was the CV tankette series, armed with machine-guns. The main gun in use on the medium tank M11/39 was a 37 mm (1.46 in), and and the brand new M13/40s, armed with a 47 mm (1.85 in), were few. The army decidedly needed to bolster its anti-tank capabilities. 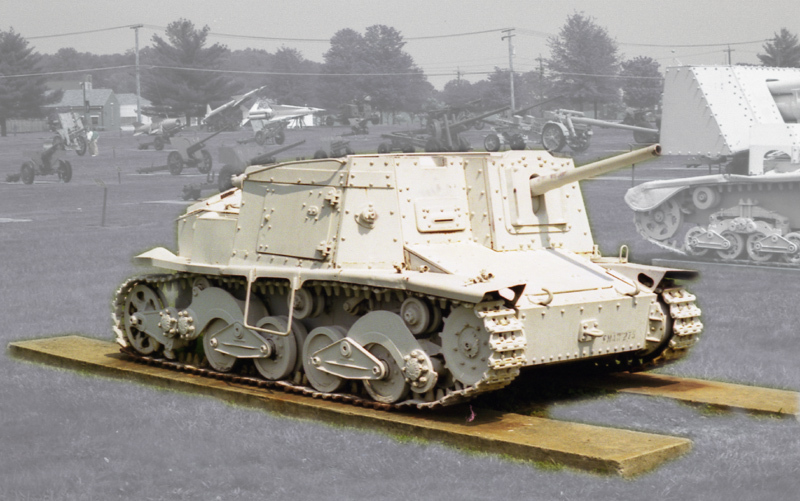 Driven by this necessity, a tank hunter was designed in 1940 based on the CV-33 chassis, the L3 da 47/32, which featured an open platform mounting a 47 mm (1.85 in) 32 caliber gun with a shield, with its servants left unprotected. This prototype was never produced. At the same time, the German StuG had some successes against tanks, even with its 75 mm (2.95 in) short-barrel howitzer, and it was decided to try a similar configuration on the brand new light tank L6/40 chassis. The conversion started when the production run of the L6/40 was ending at FIAT-Ansaldo. Work started quickly, fitting the standard anti-tank Cannone da 47/32 M35 inside an armored, but open-top superstructure built over the L6/40 chassis. 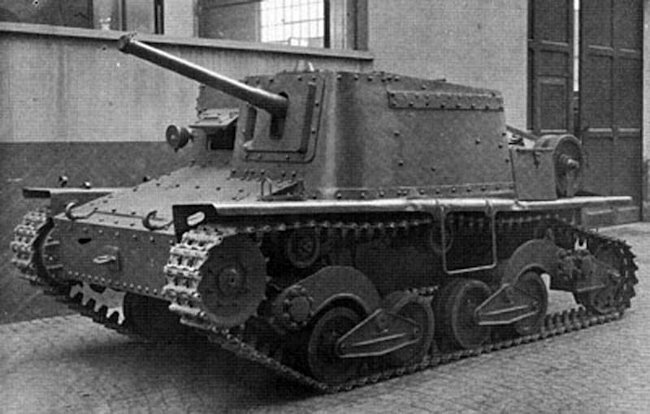 The Semovente da 47/32 (“self-propelled 47/32 gun”) kept many of the characteristics of the light tank, borrowing its engine, mechanical parts, drivetrain, tracks, and kept the same armor (30 mm/1.18 in on the front). An armored box was fixed above the chassis, mounted forward compared to the old hull, and roomier. Access inside was made through side doors and the open top. The driver was seated in the front left of the superstructure, while the gun was placed on his right. Fortunately for the cramped fighting compartment, the gun was compact enough. It was Austrian in origin, and had a 630 m/s (2,067 ft/s) muzzle velocity with AP shells and 250 m/s (820 ft/s) with HEAT rounds. Maximum range was 7000 m (7665 yd), but the effective range was 500 m (550 ft), where it could defeat 43 mm (1.69 in) of armor, and up to 58 mm (2.28 in) at close range. The production started in late 1941, but the Semovente 47/32 was not available before 1942. It was built until the Italian surrender in November 1943. By then, around about 280 to 300 had been delivered by Ansaldo and FIAT-SPA. 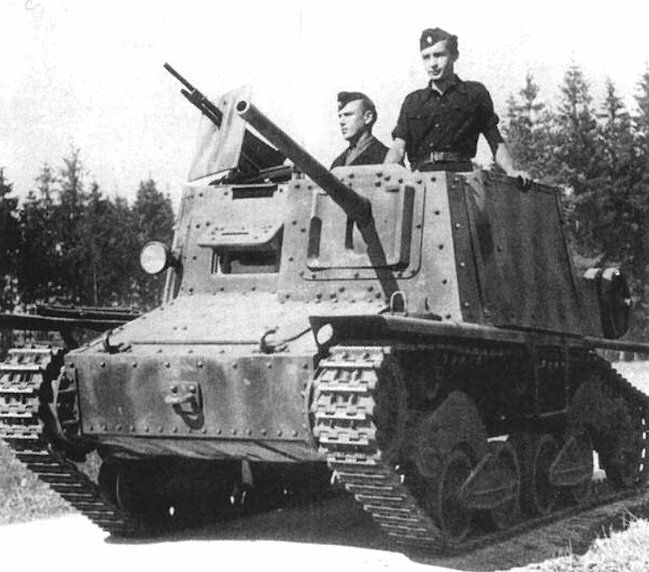 Some command versions were derived from this vehicle, equipped with long range radio sets and map tables, and the main gun replaced by a 8 mm (0.31 in) Breda machine-gun disguised as a 47 mm (1.85 in). By the time it entered service, the bulk of this new tank-hunter was shipped to the Eastern front, soldiering with the ARMIR (8th Italian army). They operated in conjunction with other forces in Ukraine, from the summer of 1942 to early 1943. It was one of the most available Italian AFVs on this front, but its main gun failed again the excellent armor of the T-34 and KV-1. By February 1943, these had been decimated by the large winter Soviet counter-offensive around Stalingrad. Others were sent to North Africa, to operate with the Ariete and Litorrio divisions from the second battle of El Alamein until the fall of Tunis in February 1943. Others were stationed in Italy. Some saw action in Sicily, apparently used by “Black Shirt” formations. Many were captured and pressed into service by the Wehrmacht in November 1943. The Germans used them as the StuG L6 mit 47/32 630(i) until the end of the war, with some being passed onto the Esercito Nazionale Repubblicano (RSI, 10 in all) and others to their Bulgarian and Croat allies. Semovente 47/32, 3rd Fast Division “Principe Amedeo Duca d’Aosta”, 8th Army (ARMIR), Ukraine, August 1942. Semovente 47/32, Stalingrad area, southern sector, winter 1942-43. German StuG L6 mit 47/32 630(i), summer 1944. I would like to know where you obtain all that information, its very rich each detail.